You are here: Home > Trading FAQs > What is a limit order? As I’ve not put on a spreadbet before, can you explain to me what “Limit” means here in this context, in the following image. Thanks. A stop loss order is one order that can be left in the market so as to automatically close a trade if the price moves against you and hits a certain level. A limit order is similar in workings but permits you to take a profit. A limit order is where you specify the price where you want to buy or sell. 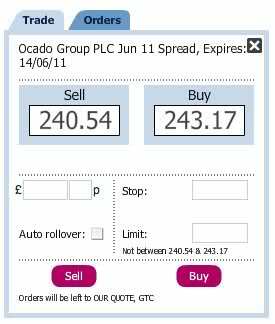 A limit order is particularly useful when attempting to capture or protect your profit in a certain spread trade. You can set a limit order of say 250p and when the sell price reaches that level the trade will close automatically. The limit is your sale price (for profit – hopefully!). In practice a limit consists of an instruction to deal at a more favourable price than the present level. This can either be used to take profits on an existing position or to open a new one. A limit order is particularly useful in volatile market conditions where some key data economic reports are expected as it allows you to place an order at a ‘no worse than’ price. So for instance for a buy order on the Wall Street index, you could for instance open an instruction with your spread betting provider to open an up bet but no higher than 11,200 pts (or the price you choose). Of course a limit order doesn’t guarantee that your trade will execute but at least you know that if executed it will be at the price you want. The most popular alternative – a market order – will execute at the current market price with no limit. Practice using both on your broker’s simulator before going live. Can I put in a stop loss or limit order after I’ve placed my trade? Yes, in most cases – simply check the open bets tab and follow the prompts to place a stop loss/limit order against your current live position.